An outlaw is someone who doesn’t follow the rules and who creates their own path by implanting new ideas that are different from the usual script of life. There is a saying in Ethiopia “ስምን መላዕክ ያወጣዋል” which loosely translates as “Angels pick the name”. That was exactly the case when we went to visit Shifta which is located around Bole, Sheger house building. The colorful interior design - a controlled chaos makes this little paradise visible from afar. We were greeted with a big smile from Maranta (Mara) and Feben who are the owners of Shifta. Their positive vibe infections to say the least. It feels like your entering into another dimension of reality as you try to figure out what is going on with the walls, amassed with a wash of colours. The kitchen sits perched above the customers setted on comfty crates whilst there are vinyl records sunken into the roof and floors. The soundtrack a collection of travels, electronic beats with reggae infused undertones. It takes you awhile to take it all in and to be honest we loved it right away as we believe everyone should have a place like this as it is a feast to the eyes and senses. “We’re trying to bring that Caribbean feeling to Addis.” said Feben when talking to EthioCreatives. “refreshing foods and drinks that gives you energy and that can give you that beach side vibe.” Feven is also the chef and the interior designer at Shifta. She was living in Washington DC and she worked there as a herbalist in the department of wellness department. She loves cooking and got the passion for it. So she decided to combine her cooking habit with her herbal background and created something special and unique in Ethiopia. Even though it has just been one month since the official opening of Shifta, it is becoming the coolest spot in Addis. Friends gather around and enjoy the art while eating healthy. We spoke with a couple of customers who were enjoying their meal. “it’s our first time here but we are coming back again for sure, in fact for dinner” said Bamlak and Linda. “The Jerk chicken siwitch is fantastic and we’re about to try BBQ Jerk chicken. We already instagramed the place as a recommendation to our friends and followers.“ We asked Bami & Linda to describe Shifta in one sentence and they both agreed that it left them speechless. 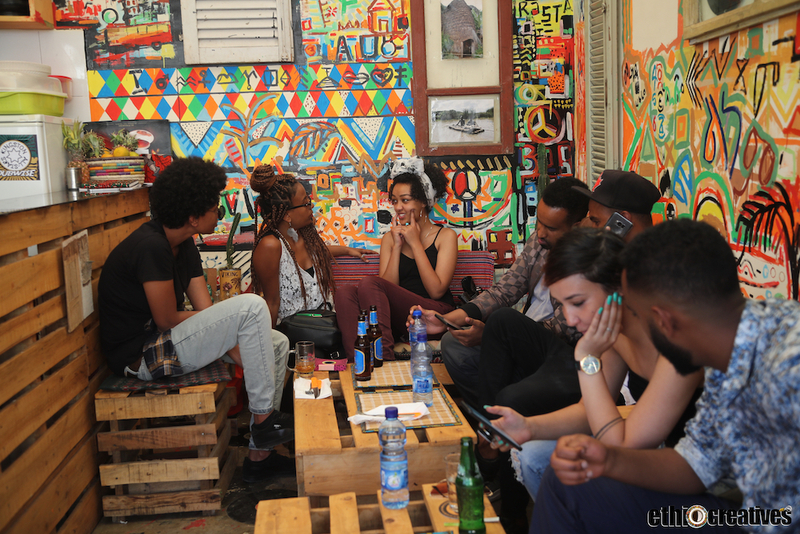 EthioCreatives also talked with Meti. It was her first time visiting Shifta. “I’m definitely coming back! I love the place, it looks amazing very authentic, very creative, very artistic and the food is amazing. It’s very colorful and different. It’s a nice place to come and chill. If I have to find a word to express this place it would be colorful. The interior design caught my eyes right away. Amazing.” concluded Meti. “Tesfahun Krub came up with the painting of the interior design. He said lets just go crazy with colors and create something new” said Feben when talking about the interior design “ he is an amazing artist. He suggested to think outside of the box. Me and Mara helped with the design as well. An artist named Zola also helped a lot by having some inputs to the design. I would like to thank all of them for helping us create this colorful design. This place was women’s hair saloon by the way.” concluded Feben with a smile. One thing caught us off guard when visiting Shifta. They serve Ethiopia’s traditional alcohol drink named Tela (ጠላ). It’s really hard to find this drink in households now a days let alone in a small Caribbean themed restaurant and that surprised us to the core. Maranata told us “it’s home made and people like it very much and it’s becoming very popular with the home made Berz (ብርዝ). “The Berz (ብርዝ) made with honey, mint, ginger and a little bit of lime. People were a little hesitant at the beginning but now they like it very much.” said Maranata when talking with EthioCreatives. This is the new place to be seen. “The response from customers has been terrific so far. There are regulars from the get go. The jerk Chicken and BBQ chicken are the most requested foods here. Everybody loves Oxtail stew as well. Another thing we’re trying very hard is to make the place vegan friendly. We have a very popular salad called Berry Madness. We have regulars coming by for our Berry Madness. We also have Shifta Salad served with Kinche and potato with a little pineapple. People’s perspective are changing in a big way when it comes to a healthy diet and we want to create the perfect platform incorporating creativity with a healthy diet.” Concluded Mara. Shifta is a little bundle of Joy serving good food, being creative and providing Addis a healthy lifestyle. We would like to thank the owners for taking the time from their busy day to talk to EthioCreatives. They welcomed us into the Shifta family with open arms as they do every customer. Shifta is indeed the coolest spot to check out in Addis.